In 1967 David Sainsbury set up the Gatsby Charitable Foundation and agreed its first grant – £50 to the Liverpool School of Tropical Medicine. David Sainsbury (now Lord Sainsbury of Turville) has since given Gatsby more than £1 billion to distribute to charitable causes. 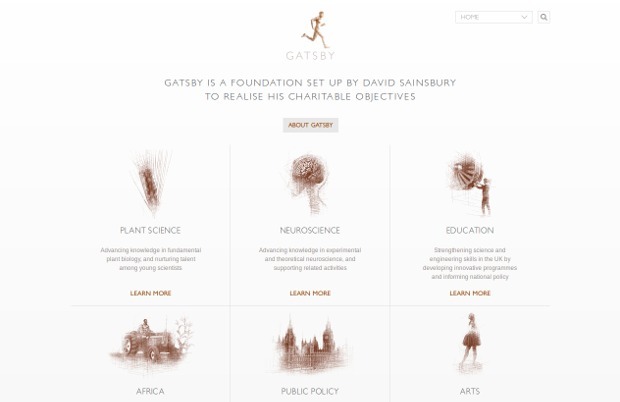 Gatsby works in areas that David Sainsbury and the Trustees are particularly passionate about and where they believe charitable funding can make a real difference – the Foundation is currently active in six tightly-focused areas: plant science, neuroscience research, economic development, public policy and the Arts. They have also supported significant programmes in mental health – in particular through the founding of the Centre for Mental Health. Across all areas, they aim to be more than a funder. They act as an enabler for projects, designing, developing, overseeing and, in some cases, delivering activities. They are proactive in putting together projects to achieve their aims. Rather than wait for third-party proposals, they identify areas of need, commission research and design interventions in partnership with sector and industry experts. Last but not least, they are particularly enthusiastic about supporting innovation. David Sainsbury has long believed that private foundations have an important role to play in testing imaginative models and new ideas that governments may see as too risky for public funding, even when they have significant potential to benefit the public if they succeed. Gatsby can incubate such models, giving them the support they need to prove themselves and build the track-records that will encourage others to scale them up.